This is the first article in a series on high performance networking and computing. 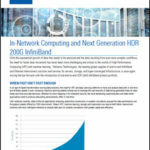 This series, compiled in a complete Guide available here, is focused on today’s top trends in HPC networking. The series also covers available high performance interconnect technologies and how to select an HPC technology and solution partner. Download the insideHPC Special Report. The entire information technology industry is in the midst of its biggest transformation since the introduction of the PC in the early 1980s. Looking back over the last thirty plus years, there are very few technology companies that have successfully navigated that industry transition from single vendor proprietary products to broadly adopted de-facto or formal standards-based technologies, and open source software offerings. The high performance interconnect landscape is in transition. InfiniBand and Intel Omni-Path will compete for the performance crown, while Ethernet will remain the ubiquitous standard for commercially oriented systems. Complex computational and data intensive workloads frequently exceed the capabilities of an individual processor or computer system. Over the years, systems have evolved to add more processors, and to combine multi-processor modules within a single system. Both symmetric multi-processing (SMP) and massively parallel processing (MPP) systems combined multiple processors within a single system typically connected by a proprietary interconnect or backplane. While effective, these systems were typically very costly which led to the current trend of connecting lower-cost volume servers with a high performance network interconnect to create distributed, clustered systems. In the November 2016 TOP500 list 86% of the systems were clusters with just 14% being MPP systems, which emphasizes the critical importance of high performance interconnects (HPI) and networking to the current computing environment. As the Internet of Things, big data, real-time analytics, deep learning and artificial intelligence systems proliferate through all aspects of business and personal computing, the importance of high performance networking to support the clustered systems that provide the back-end analysis capabilities can only increase. If you prefer you can download the complete report, A Trusted Approach for High Performance Networking, courtesy of Dell EMC and Intel.